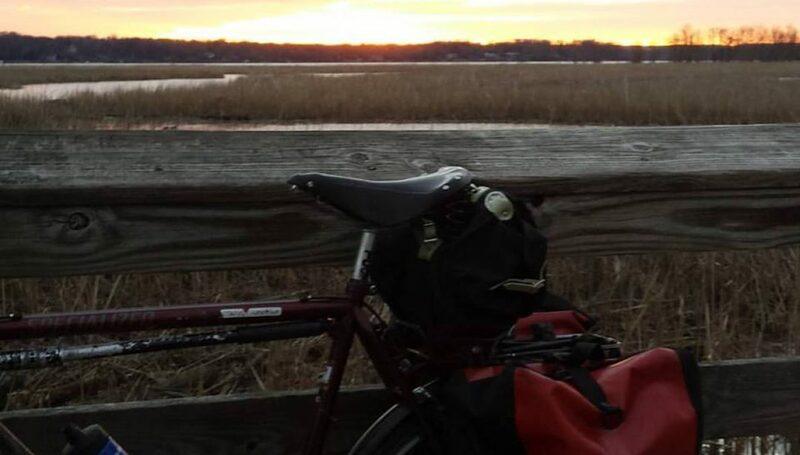 After 150 miles of cold bike commuting, I was going to take the day off. I lazed around the house until I couldn’t stand my boredom. Then I remembered that the Washington Area Bicyclists Association was doing some sore of work at Jones Point Park, about 5 1/2 miles from my house. I decided to go there and lend a hand. I rode Deets, my Surly Cross Check. It was the first time in two or three weeks. Without loaded panniers, I cruised along at 3 miles per hour faster than The Mule. I felt like I was flying. There was some ice on the edges of the river. Yes, it’s really winter now. Temperatures were just a bit above freezing. I pedaled along with little effort. When I arrived at Jones Point Park, there was nobody there. I checked social media and learned that WABA had plenty of help and made fast work of their project. So I decided to cruise through Old Town looking for stocking stuffers for the ladies of the house. I spotted a vintage fire engine in front of a fire house. When I went to take a picture I saw that Santa and an elf were posing with kids. After that I made my way to the farmers’ market at City Hall. The vendors were packing up for the day. I noticed a harpist bundled against the cold. From the looks of her donations box, it had not been a particularly fruitful morning. I tried to engage her in conversation but she had on her cloak of introversion. I left her a dollar and rode off. outh says that this place makes awesome sandwiches. I had to walk down the street and up the next to find something to lock my bike. Then I walked back to the store. Inside I found that there was no seating, only chairs on the patio. Not wanting to freeze I decided to come back in the spring when I can get a sandwich to eat outside. I made my way back towards home. Old Town was not at all crowded. I took the Wilkes Street tunnel for the first time in over a year. Something about it is inviting. I had about 6 1/2 miles to go. With 4 miles left my toes started to ache from the chill. Instead of focusing on my toes, I thought about how I could modify my toe clips with some neoprene toe warmers. Maybe I can use zip ties to attach a toe warmer to the cage. Hmm…..
Posted on December 10, 2016 December 10, 2016 by rootchopperPosted in #bikedc, Old Town AlexandriaTagged #bikedc, Old Town Alexandria.